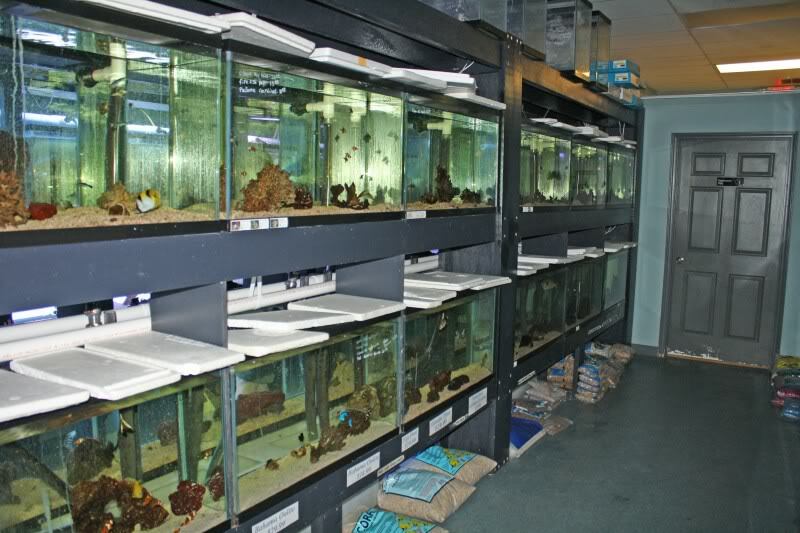 A lot of times advice given by petstore employees are not in the best interest of the fish. Keep in mind its their job to sell them so that means they don't mind if you have to keep buying fish. My best advice is to see what fish interest you at the pet store then go home to research them as much as you can on the internet or in books. I, along with most all expierenced fish keepers, have learned that impulse buying usually doesn't work out. Here's a little trick I learned many years back. To get a clue as to how much they might actually know, simply ask them what fish they keep, get them to talk about thier fish and setups. I don't try to undermind them in any way, I listen to what they have to say... it makes it much easier to tell who might know what they're talkin about and who might be there just cause they needed a job and Petshmo was hiring. will know that they aren't hybrids or rejects. I will make a point. The average pet store employee has no clue. It is hard if not impossible to get pure bred peacocks anymore from LFS's. I do know there are breeders that sell to some good fish stores. If they do not buy from individual breeders like Vince, myself, Klaus or some of the others on here. I woiuld be leary of purchasing peacocks. One of the most common things you hear is "Sunshine Peacock"
when they are refering to a Baenschi Peacock. A Maleri Peacock, is a "Sunshine". This is a dead give away they don't know peacocks. These large distributors sell fish and put any name they want on them. They also do not care if they are cross bred they sell them to petsmart and other LFS's as whatever they think it could be. They also use color enhancement, I got what I thought was a great little male red shoulder. "SHE' Wound up causing lots of problems in my male show tank. That broke me and I no longer buy from any LFS's when it comes to Peacocks. I was buying for a show tank and not breeding. If you want true pure bred PEACOCKS try to go to a quality breeder. At least ask if a small store, if they get them from a local breeder or a supplier. I keep my breeders in species only tanks. Absolutely no chance of crossing. To be sure I would buy directly from a breeder and just skip the chance of getting something you don't want. Guys please understand that not all pet store employees are ignorant salesman. Keep in mind when u go to a petstore thats sells fish, dogs, cats, etc... they arent going to know everything about all the animals. if u go to a store that is aquarium dedicated then u should find a more informative staff. there are good, informative, non-sales oriented fish shop employees out there (trust me im one of them). At my store we have our reef geeks, live-bearer geeks, cichlid geeks... and so on. now does my best live-bearer geek know alot about cichlids? no. but they will find u someone who will (Chris to the cichlid aisle please. Chris to cichlids). I turn down as many people as i sell to. If u buy a fish from me and it dies, u can bring in the body of the fish and a separate water sample and we go from there. If you bring in a dead fish without a separate water sample i will refuse to sell u fish. Its not fair to the hobbyist to not know why his fish are dying and its not fair to the animal. and no offense but: IF YOU'RE GOING TO PETSMART OR PETCO FOR AQUARIUM ADVICE YOU ARE SILLY, those stores are where u find Prime and NLS, don't talk to anyone, don't look at the poor hole in the head diseased Oscars, just get your Prime and NLS and run. once again if your buying your fish at a big box store expect to get what u pay for. now don't make me start telling stories of some of the CUSTOMERS I've had to deal with! Being as I have owned 2 lfs & managed another it's not only pet store employees it's also the owners & suppliers to the lfs . 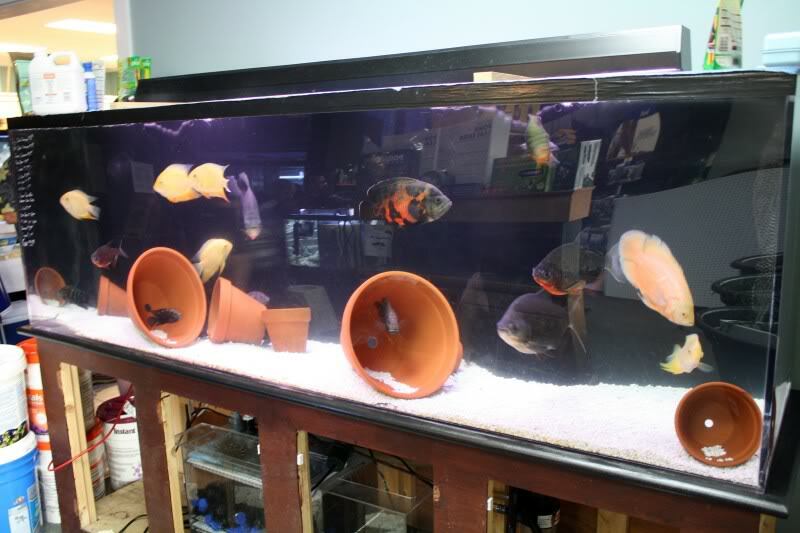 The lfs in my town is a businessman only, not a keeper .Most just call them what they think they are so it's passed down to the lfs . Not putting you down addicted2cichlids but as a whole Roger is right . Only a very few people that I have come in contact in the fish industry even kept fish before they started dealing in them & then most are all about the $. Heck I fired 1 of the best sellers that I ever seen as far as $ but I couldn't put up with out right lying to a customer( sexing Red Tail Sharks at 1.5"even though they are almost impossible to tell at full size) just to make a sale . It's very hard if you live in a rural area to shop . I'd say in a 150 mile radius there is 1 reputable lfs & then you have to get a good employee or the owner to get what you want or know what you getting if you don't already know . There in lies the great point of stupid lfs . Sometimes they get shipments that they have no idea what they've got & sell them at a super low price . I once bought 8 Blue Eyed Plecos @ $1.99 ea. from a lfs . The employee barked at me ,when I told her that her sale tank of plecos had some fancy plecos , that they are PRICED AS MARKED!! Kept them for 14 years the last passing 3-4 years ago . They now sell at $1500-$3000 & sold at $50-$200 then. It's a buyer beware market. Summer 2008 I was desprate for a job and had looked every where, and drove past the one fish shop in town turned around and whent in. I got the job with out ever having a tank! I'm not one of those that will tell you something I know nothing about. So I was constantly looking for answers from my boss and other employees, they were frustrated with me that I asked them. I didnt hide the fact that I was a fish noob when I asked for a job. Needless to say I learned a lot fast.... So yes buyer beware. What I do NOT understand about our local PetsMart, why the cichlids they do sell, are the fish that people are going to most likely be unsuccessful with..... zebra/lab hybrids, auratus, kenyi. They used to get in a few other "dubious" species, but those are all I have seen in there lately on my shopping trips for dog,cat, and canary food, and Prime. Is it really because they know these fish will kill each other and the customer will be back for more? It's really sad. most LFS salepeople know very little about the hobby. I only wish there were more of you out there! Chris I know you used to have pictures from your work. I am sure that would make everyone drool to see your store and to know that knowledgeable salesman work there as well. How does a LFS keep their Nitrate bbelow 5ppm? No Oscars in 20gallon tanks here, he never orders the big fish, they always manage to find there way to him from customers that started with that 20gallon petsmart tank with the cool fish that eats anything. As a forum members we get special deals and the heads up on any sales going on in the shops around here. Every employee is a forum member also. When you have a problem or need something all it takes it a phone call or a post to get help. Even if your power goes out during a storm they will house your fish for you if they have the space. Guys, I really want to say. I did mean this towards everyone. I should have said for the most part. 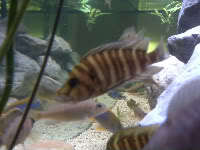 We have a friend on cichlids.com. that owns a shop. His tanks look as good as most peoples personal tanks. He does know about fish as well. On average the LFS or Large chains hire people that want a job. Not because they are fish keepers. In our local area, we have two fish stores and a pet-----. 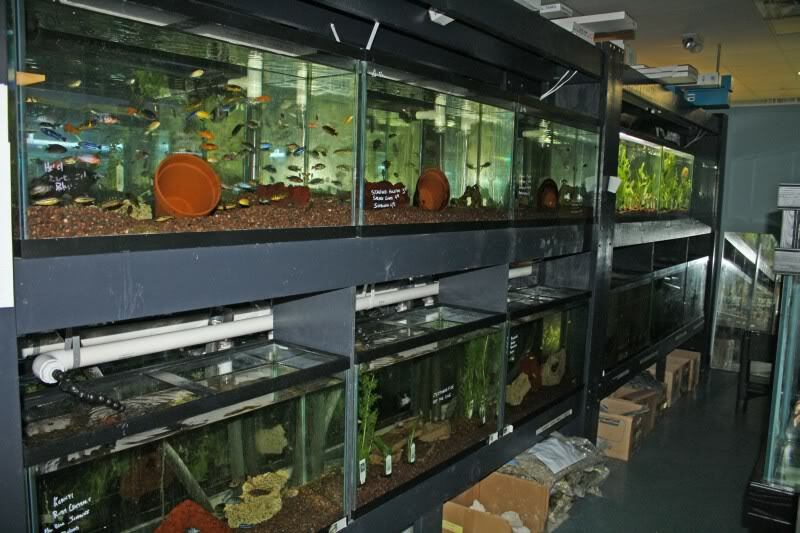 One fish shop has been here for many years and the owner has a few tanks of his own at his house. He brings in live rock, corals and fish to sell every now and again. His knowledge might be vast but he doesn't talk much. The employees are a mixed bunch, those that know and care to those that could care less as long as they get a pay check. The other fish shop is owned by a guy who has a lot of money and his girlfriend who has zero knowledge. By the way, she used to be an employee for the first fish shop listed here. We try to put money into the local economy and try to buy from these two places as much as possible. But... Depending on the day and time of day, the local petcosmart actually has some of the most knowledgable fish peolpe in town. I am not just talking Dumb and Dumber here. They have/had people that could put some of us to shame. Now, I realize that things can change so don't run up here for advice but lets just say that I have gotten some good advice from two of them. When you say "Hey, I want that fish there." and they say " Umm, what kind of fish do you have in your tank cause that one is..." you kind of see some knowledge there. The original intent of the article was not to put down on anyone. It was to let new people to the hobby know the need to research information given to them. That not only goes for information given by pet store employees but stuff you read on forums as well. I will get information from as many people as possible before acting on it. My thinking is if you hear it from several people then it may actually work. I'll have to say that I am hopelessly addicted to stopping in at Local Fish Stores if I happen to be in the area. My line of work takes me all over the greater Las Vegas Valley and my truck has always had a will of its own. Over the years I have seen many employees come and go. Some without a thought and others I was sorry to see missing. Only a few of these stores actually have Africans easily identifiable as true to form. It is a blessing when the employees and/ or owner actually knows what they have. More often than not they don't and I try without being obnoxious to pass on a little information to those genuinely interested in their job. Don't discount the Box Stores. Some are owned by individuals that actually get some nice fish in. I bought my Kenyis from a Petland and to this day they remain the best I have seen in this area. Having a knowledge of what you are looking for will allow you to pick and choose with greater confidence. All in all though, the best place for getting what you want are (Great) Forums like this one. Mail ordering may seem scary but you will get what you want from sellers that have been thoroughly vetted by very knowledgeable people. You get what you pay for and unfortunately sometimes get burned if you don't research. Keep all your options open and pick wisely whether it be an LFS, a box store or an online vendor. After reading this thread, I think it comes down to the intellect of the advice seeker. Yes, I am new to Cichlids, but am a quick study. I have learned a lot from you all on this site, as well as books, articles, and other sites. I have gotten some beautiful fish from big box stores, as well as from smaller 'fish only' stores and mail orders. I have also gotten burned by them all... I must say that any advice that you get from anyone should be confirmed from another source, and if you find the advice to be common, FOLLOW IT.